dotts M are customisable, wireless 3D printed headphones... | What Hi-Fi? ...or at least they will be by November 2018, when deliveries are expected to begin. Spanish company dottsaudio has raised well over 100 per cent of the money it needs to bring its dotts M wireless noise-cancelling 3D printed headphones to market, according to indiegogo.com. Apart from the funding model, there are a number of other intriguing apects to the dotts M design. The company is claiming 40 hours of battery life from a single charge, wireless aptX HD connectivity via Bluetooth 4.2 and voice control via Google Assistant, Siri or Cortana. 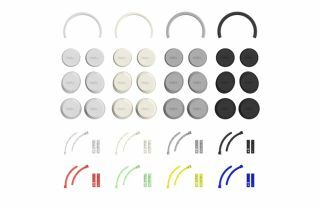 The headphones are customisable (in- or a pair of on-ear options are available, and along with numerous colour choices there are more than 600 possible permutations), and all major controls are positioned on an earcup touch-panel. The headband is made from a sustainable (but unspecified) material, one strong enough (the company claims) to be "virtually impossible to break" and able to "withstand the strength of a car without breaking". It certainly looks very flexible in dottsaudio's promotional video. Back the indiegogo campaign in the next few weeks and a pair of dotts M can be yours for €109. Drag your heels and you're looking at €180.